IBM® Planning Analytics, the latest release of Cognos TM1, automates your business collaborative planning, budgeting, forecasting and analysis processes. Influential Software, as IBM® Silver Business Partners, provides best-value IBM® Planning Analytics Licences, as well as other Planning Analytics Services and Support. Powered by the enterprise-grade TM1 platform, IBM Planning Analytics runs alongside business analytics and reporting applications like Excel. So your teams can access real-time data from anywhere across your enterprise with self-service analysis through a dynamic, customisable workspace. Flexible and agile, Influential Software offers Cloud, On-Premise or Hybrid IBM® Planning Analytics Licences to suit your business needs. IBM® Planning Analytics drives efficiency through improved staff productivity and reduces cycle times. It gives you the flexibility and agility to adapt to changing market conditions by combining financial plans with operational tactics based on dynamic, driver-based models. It also delivers insights, automatically, from your data and helps you pull ahead of competitors and stay agile for the changes ahead. Make self-service, cutting-edge analytics available to your entire organisation. IBM® Planning Analytics has all the capabilities you need to transform your business and finance within a single solution. “Analytics are the backbone of the modern business. IBM® Planning Analytics provides the deep, real-time analytical insights that make a difference for your business”. 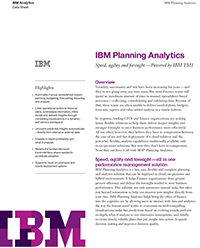 What Can Your IBM® Planning Analytics Licence Do? IBM Planning Analytics Cloud offers a flexible, scalable platform can be used by individuals, teams, workgroups or the entire enterprise. Formerly known as IBM Cognos Express, IBM Planning Analytics Express bundles together IBM’s two industry leading analytics solutions, IBM Cognos Analytics and IBM Planning Analytics, into a single package ideally suited for small businesses or teams. Deliver planning, budgeting and forecasting for workgroups and midsize companies, along with essential reporting, analysis, dashboard, visualisation and scorecarding at an affordable price. IBM Partners Influential Software provide a complete range of IBM and IBM Planning Analytics services to help business get the most from their Licences. We have expert consultants who can help plan and manage your install, migration, or upgrade. We also have award-winning support and maintenance teams, as well as training and resourcing services. Download this pdf Data Sheet (1.5MB – Opens in a new window). A great overview of the highlights and features of IBM Planning Analytics. Influential Software is an established IT Consultancy firm specialising in Business Intelligence (BI) and Enterprise Performance Management (EPM). 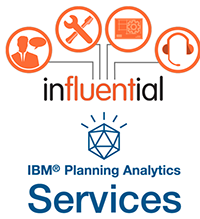 If you’re interested in our IBM Planning Analytics Services, why not visit our dedicated site? 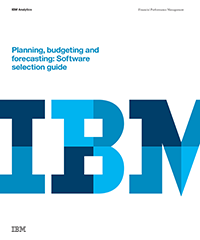 Planning, budgeting and forecasting: Software selection guide.